Margot Robbie Gave Cara Delevingne Emoji Tattoos on Her Toes!! **Update: In a #tbt Instagram post uploaded to Cara Delevingne’s Instagram account in July 2016, you can see the model posing with Suicide Squad co-star Margot Robbie, showing off the “toemoji” tattoos Robbie gave her during filming. In an interview with Vogue last month, Margot Robbie talks about her obsession with ink and the never-before-seen tattoos she gave Cara Delevingne, her co-star in the upcoming film Suicide Squad, way back in August 2015. We already guessed that Margot had given Cara some fresh ink on the bottom of her foot, but Margot revealed in the Vogue interview that the “tattoo” was actually five tattoos – a tiny emoji inked on the bottom of each of Cara’s toes. “I have a bit of a morbid fascination with needles,” Margot told Vogue writer Jonathan Van Meter during the interview. “There’ve been a few instances where I’ve given piercings.” She also owns her own tattoo kit, given to her as a gift by her best friend, Sophia, after the actress finished filming Tarzan. According to Margot, while shooting Suicide Squad, in which she plays the demented Harley Quinn, “people would come into my trailer: ‘Hey, Margs – can I get a tattoo?’ ‘Sure – sit on down!’” It’s then that Margot mentions the tattoo she gave Cara Delevingne, a unique design she dubbed “toemojis” – five emoji faces inked on the bottoms of Cara’s toes. “And then we all decided to get Squad tattoos, David Ayer included,” which Margot inked in her full Harley Quinn getup. Margot Robbie loves giving tattoos so much, she travels with her tattoo kit everywhere she goes, and even inked the Vogue writer interviewing her that day, giving him his very first tattoo – a Roman numeral “V” tattoo for his birthday (May 5) and his last name (Van Meter). It’s no surprise then, that all or most of Margot’s cast mates ended up getting “SKWAD” tattoos commemorating their time together on the set of Suicide Squad. Cara Delevingne, who plays Enchantress in the film, also got a Suicide Squad tattoo along with the rest of her cast mates that day, but has yet to reveal the ink, which could be located virtually anywhere on her body, possibly even on the bottom of her foot, where she already has her infamous “Bacon” and “Made in England” tattoos. 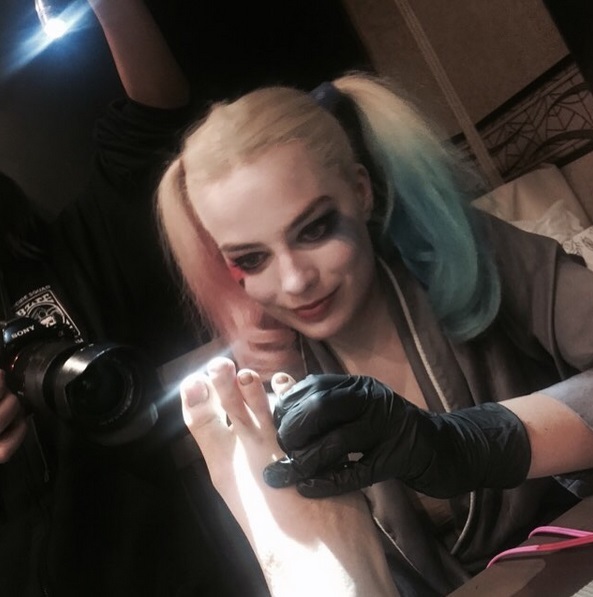 In photos taken the day the Suicide Squad folks were getting their matching “SKWAD” tattoos, Cara is also shown giving someone else a tattoo on the bottom of their foot and/or toes. Cara posted the photo on Instagram, captioning the snap with a single devil emoji. Is it possible that Cara and one of her co-stars got matching devil “toemoji” tattoos? ?